We know that Microsoft has owned Skype recently. To promote New search engine called BING and to compete with Giant Google, Microsoft giving away free 60 minutes Skype call credit for searching on Bing. Yes, just search 30 queries on Bing everyday and earn 15 bing credits. 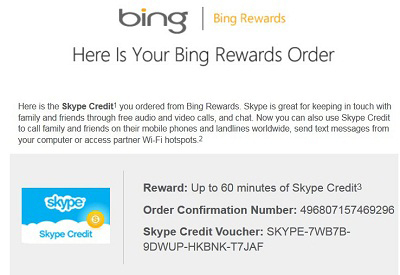 After earning 100 credit you can redeem for FREE 60 MINUTES SKYPEE call. Lets Get free 60 minutes Skype call credit from Microsoft . Actually this offer is only for USA residents . What if I am not from USA ? Don’t be panic. Techspree is presenting a trick for you. Step 1 : If you are from USA you don’t need any VPN(Virtual private network) or changing your IP address. Its only for those who are outside of USA. If you are not from USA and want to get free skype calling credit then first Download this VPN . This VPN gives you free use during a trial period. You can use 60 minutes maximum per day. This is enough for 30 search queries, isn’t it? Step 2 : Run installer.exe after downloading. It will prompt for password. step 3 : Now select LA USA server. When it says connected , minimize it and open browser. step 4 : Now go to Bing Rewards and sign up with a Live/Hotmail account and DONE!! step 5 : Get some bonus credits by connecting your facebook account. First , if you are not from united states then there is a chance that you will get caught by Microsoft sooner or later. But I am using one account since a year though I don’t live in USA. So First choose an appropriate VPN and once you choose it just fix it. 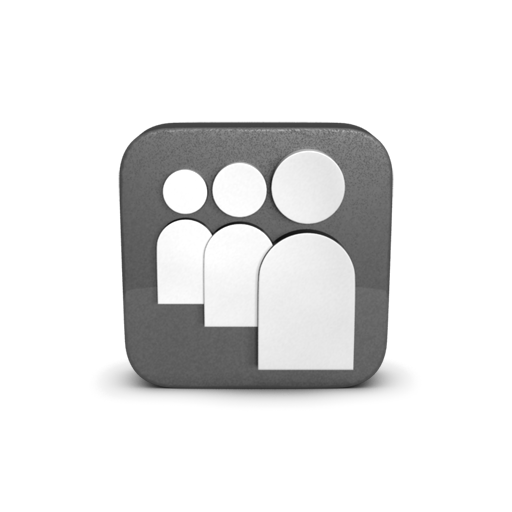 Now Create a hotmail account with this VPN and remember the VPN ip or SERVER ID. Always use the same server / IP to get Bing Rewards. Don’t create Multiple account with this IP. If you want more Bing Rewards Account then use another VPN. Secondly, after getting 100 Rewards point you will need to go to the Redeem Tab and Select 60 Minutes skype Bonus. Now it will ask you to write your address and Mobile number. This is the situation where most of the users get stuck. Getting an USA address and Phone number is super easy. First Open up Google and search for any Hotel or University address and you will get both address and phone number there. After you redeem your free 60 minutes credit you will be sent an email to your hotmail account. Now copy the redeem code and Visit Skype.com and login with your skype account and paste the code. Thats it. Redeem 60 MINUTES FREE SKYPE CALL CREDIT after earning 100 credits. This may require just 2 or 3 days to get 60 minutes free skype credit. So don’t miss it. Bonus Tip: You can also get these rewards using your Android mobile also. Follow same procedure and use VPN for your android. Now Download and install this awesome automated app for Bing Rewards which can do all Bing rewards activity for you. You just need to run this app everyday and it will automate all things. Hope you will like it. Comment your reviews below. Keep sharing and come back for more tricks. Thanks! First of all Sign up Here You must have a live or hotmail account . Next it will associate your account with Bing Rewards. Now what you have to do is Everyday Login to your Bing Reward account and then search in Bing 30 queries . You can search anything. Per search you will earn 0.5 credit from bing. So everyday 15 credits. But you will get other offers from Bing Rewards Dashboard. After you earn 100 credits you will get 60 minutes skype call credit worth 2.8 $. Now you need to Redeem your credit. Just go to Redeem Tab from dashboard. Wait 24 hours then check your live/hotmail email . You will get a redeem code. Next you have to enter this code to Skype.com website. Its not available in your country. So you need to Use USA ip. Try VPN software and change your IP. I got 100 credits using hotspot vnp shield. but when i want to redeem my 60 min free call it requires to add mailing address, city, zip code,phone no. First go to google and write “whats my ip address” and you will find your ip address and its location. Now you need to know its state or atleast its city. Now again take help from google and search for some popular place in that city like popular hotels etc. And fill up all the information accordingly. Now you need to find a mobile number and you can use the same procedure . Remember, Its not only about false address that your id is being banned, but also for your ip address and your searching behavior may lead to ban your id. brother, this uName/passwd does nt work . . . .msg shown here is “The free trial account’s passwd has been changed…….. ” pls help me boss. This is pretty cool. But how does this thing works? It looks suspicious to me. I have a friend in south america. I made her call one day through skype and the other day I saw an advertisement under small advertisement area on skype that says “Call Landphone in South America free” but when I clicked that add, it took me to the page where I was being asked to buy credit if I want to make call in south america. I found its a marketing tactics but I am happy for those who get something for free. Thanks for sharing this article though. With the way you explained it, it looked so simple. I will try it and see how it goes.